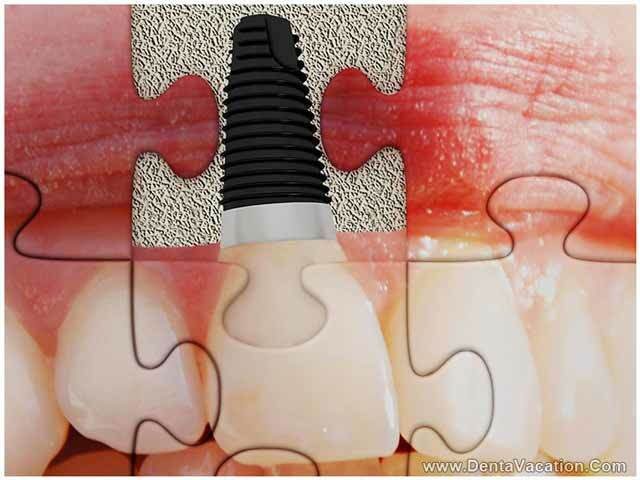 Dental Implants have largely replaced the other treatment options for missing teeth. But not all patients can receive implants as certain conditions need to be fulfilled before these technique-sensitive wonders can restore your smile. One common hindrance for many implant seekers is inadequate bone. Many patients especially from first world nations also delay the dental implants procedure for another reason which is the ‘cost factor’. They fear the high costs attached to the entire process. However with the development of Dental Tourism the scenario is changing. Thousands of patients travel to places like India, Thailand and Mexico for affordable dental work. Dental Implants are basically metal posts that are drilled inside the jaw bone, and one basic requirement for their successful placement is the presence of healthy and sufficiently thick jaw bone. If your jaw bone is too short or narrow because of because of tooth loss from periodontal (gum) disease, injury or trauma, or any developmental defect, you may not be a suitable candidate for dental implants. In old days, such patients would be flatly refused any kind of implants, but the advancements in dentistry have allowed for the bone to be built up to a level, where it can be deemed fit for receiving implants. The process of augmenting the bone is called ‘bone grafting.’ Dental implant bone grafting is a lengthy process, but it is commonly done in dental offices. The process involves the addition of a healthy bone or bone-like material to the jaw; the grafted material may take a few months to fuse with the existing bone. The added material will also stimulate the formation of your natural bone around it. Several procedures can be used for bone augmentation, and the one to be used in any particular case depends on the type, location and number of implants to be used. Bone to be grafted is taken from the body of the patient himself (usually from the hip or the mouth). Since the harvested bone comes from the patient’s own body, autografts tend to form easy compatibility with the jaw bone. 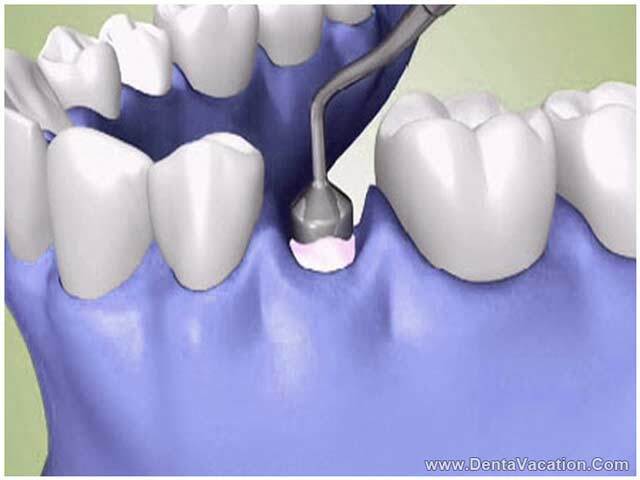 Two operations are required for this procedure (one for removing the bone from a site, second for adding it to the jaw). But it also has some significant advantages: the risk of disease is comparatively low as patient’s own bone is being shifted to another location in his body. Besides, the risk of bone rejection is also almost negligible. In these the bone is harvested from animals, usually cows. It is then processed and made sterile and biocompatible. Eventually, the animal bone filler is replaced by natural bone. Allograft bone is taken from human bone donors in the event of their death. The bone is collected under the very close supervision of bone banks. The bone is then put through various tests and sterilization techniques to ensure that it is safe to be used as a graft. These are made from synthetic materials, usually calcium phosphate, which mimics natural bone. Over time these are resorbed into the body and as they encourage natural bone growth, the patient’s own bone tends to replace the grafted material. Sometimes grafts are also made from materials which cannot be resorbed by the body; so these act as a scaffold over which natural bone can be built. Bone grafting is a commonly done procedure, which enjoys high success rate but there is always a chance of graft failure. Bone graft failure is usually because of an infection or because an unstabilized graft may become loose from the jaw. People who smoke and those with certain medical conditions always have a higher risk of graft failure. A failed graft can be removed, and once the area has healed, it can be replaced with a new graft. The implant procedure is already an expensive one. Obviously, in patients who require an additional bone graft surgery, the costs will go up further higher. The costs may vary from patient to patient, depending upon the requirement. However dental implants in India, Mexico, Thailand or Costa Rica are affordable and pocket friendly. A patient especially from the US could seriously consider dental care treatment in these nations as the costs are more desirable and practical.